Campagnolo announced 12 speed versions of their Record and Super Record groupsets (both in hydraulic disc and rim brake options) back in April. There was a modest buzz around them, as with any new gruppo, but it was very much a case of evolution, not revolution. The introduction of 2x12 gruppos was inevitably met with cries of "11 is enough already!". Cyclists can be a conservative bunch, and there's an (often justified) scepticism about change for change's sake. But there's a solid reason for 12 speed, and it's not about having a wider gear range. In fact the new cassettes are available in 11:29 and 11:32 ranges - no bigger than the previous 11 speed versions. The benefit lies in closing the gaps between gears. Maintaining a smooth pedalling cadence is key to efficiency and performance on the bike, it's something we pay particular attention to as part of our bike fits. Anyone who's ridden a 1x drivetrain on the road will be familiar with the jumps between gears, making it difficult to find the sweet spot to maintain a steady cadence. This isn't so much of an issue off road, where having a wide span of gears, simplicity, light weight and ultimate chain retention mean that 1x drivetrains have rapidly become the norm. But on the road, where modern front mechs work with near faultless reliability and the chain isn't being bounced around all over the place, there's no real hardship to maintaining a 2x system. And in doing that, it gives the chance to really close down the gaps between gears, often to just single teeth differences (for example the 12 speed 11:29 cassette goes: 11/12/13/14/15/16, then 17/19/21 and 23/26/29). The cassette and chain are at the heart of any increase in gear count. 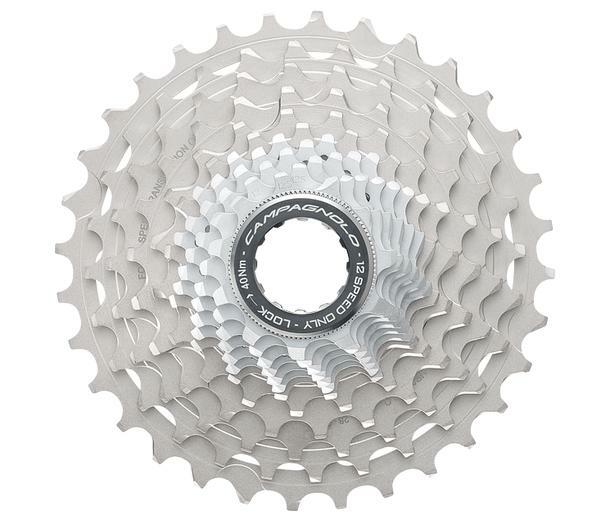 There's a finite amount of space for the cassette to occupy, and so more gears means slimmer cogs and thinner chains - but there can't be any reduction in precision and reliability. 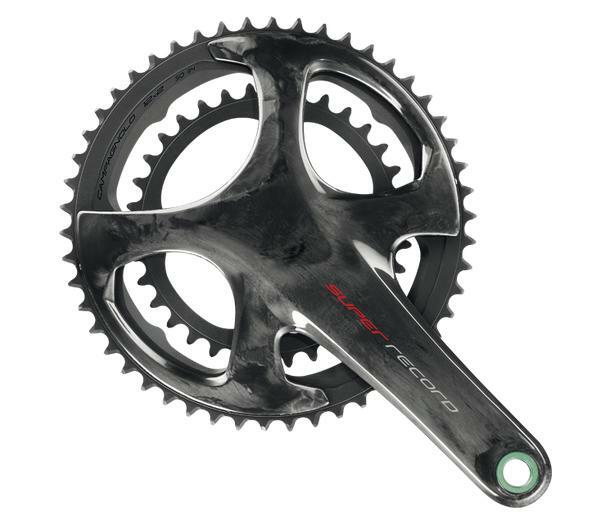 By slimming the sprockets, and reducing the gaps between them, Campagnolo have managed to make their 12 speed cassettes the same overall width as the previous 11 speed versions. So you're not forced to ugrade your wheelsets - the new cassettes will happily fit on existing 11-speed freehubs. A nice touch is that the spacers betweeen the sprockets are now all the same width, which makes initial installation a doddle. 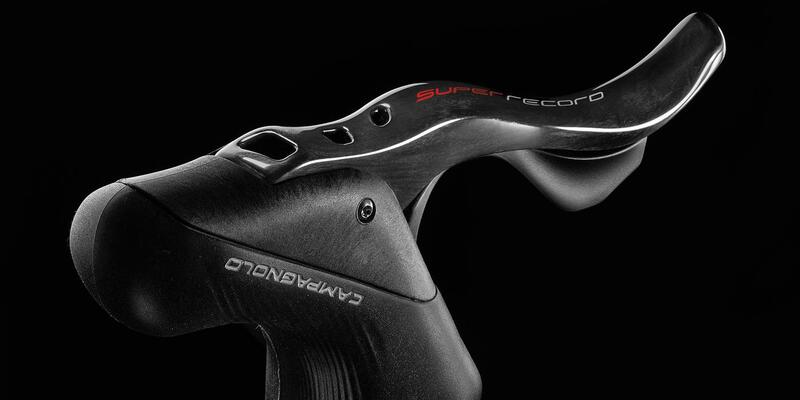 Both the Record and Super Record brake/shifters have seen some subtle changes to their shape. The levers are now a little longer and slightly flared at the ends, making them easier to use when in the drops. The thumb lever has also been reshaped and is now just a tiny bit longer, again for ease of use. We're at the stage in development now where you can't really go wrong with any of the top end groupsets, shifting technology is almost faultless, and so it's unsurprising that the new Campag gruppos are as smooth and reliable as their Shimano equivalents. If you're a Campagnolo fan then this is a no brainer, there's no reason not to spec these on your bike. If you're on the fence then it comes down to personal preferences and aesthetics (see the cranksets, below, for more on that!) and whether you find value in the traditional Campag facility to shift up as many five cogs at a time, or shift down by up to three at a time - something you might not realise you're missing until you try it! One thing to mention from personal experience - I run both Shimano and Campagnolo on different bikes and have never had any issue swapping between the different styles of shifting. So don't be afraid to have a mix on different bikes if you want to get the best of all worlds. In recent years Campagnolo crankset designs have been sure to divide opinions, and these are no exception. 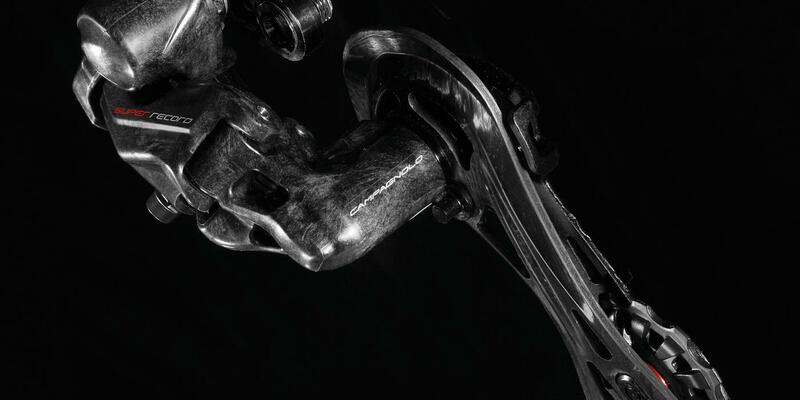 The Super Record (pictured right) sees the crank arms "coupled" together to provide extra stiffness, with carbon cranks, titanium axle and aluminium chainrings. The Record is a more conventional four arm design, with a steel axle. They've also gone "hole free" on the drive side crank arm (i.e. no visible fixings for bottom bracket) for those aerodynamic "marginal gains". Aside from that, there's just some small tweaks to the shape and size of the teeth to allow for the 12 speed drivetrain, and a few other minor tweaks and adjustments. They still use Campagnolo's familiar "Ultra Torque" BB cups. 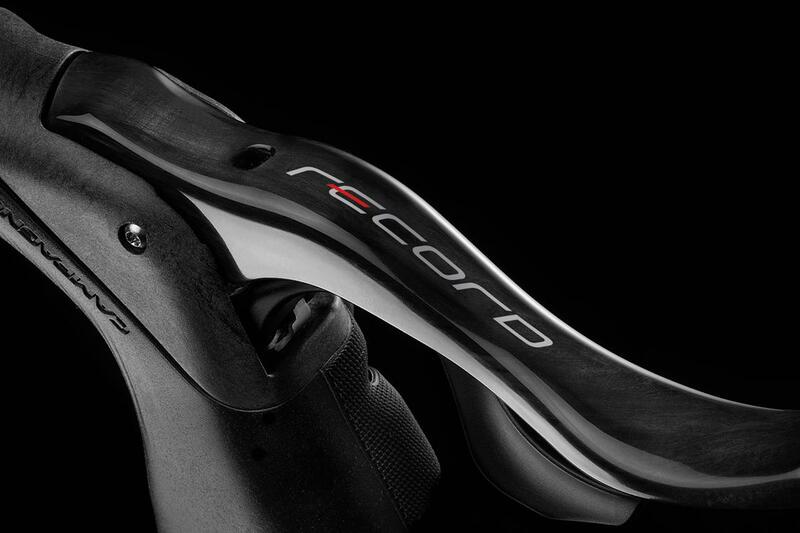 These will look right at home on a modern carbon monocoque frameset. On a more traditional steel/Ti frame? Well, we'll reserve judgement on that for now - keep an eye on our Build Gallery to see examples. 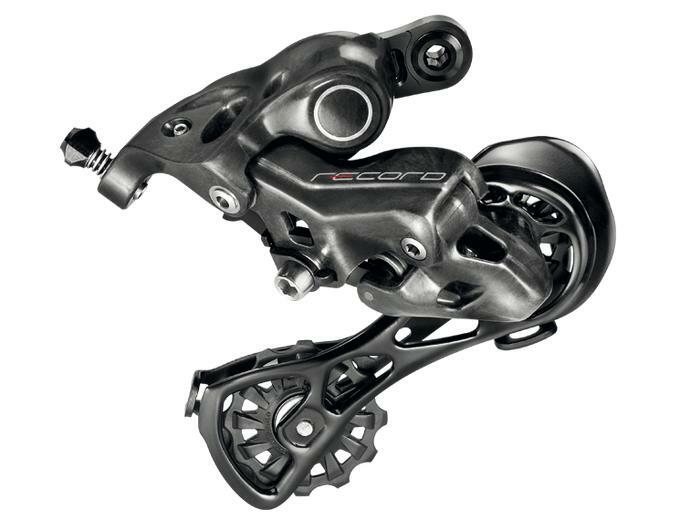 As always Campagnolo are keeping the options nice and simple with the rear mech - the one standard rear derailleur will work with anything up to and including the 11:32 cassette. The jockey wheels now have 12 teeth, which they say adds smoothness to the transmission, and there's a spring to tension the upper body of the mech to keep things under control on rougher roads. The front mech has had a thorough overhaul, most noticeably with a new upper linkage that significantly reduces the amount of free travel when shifting, making front shifts far swifter and easier (my only real bugbear with the older systems). There's a whole host of options on the braking side of things. Naturally there's a choice of rim brakes or disc, and the rim options again see Campagnolo offering both direct mount and traditional caliper options. 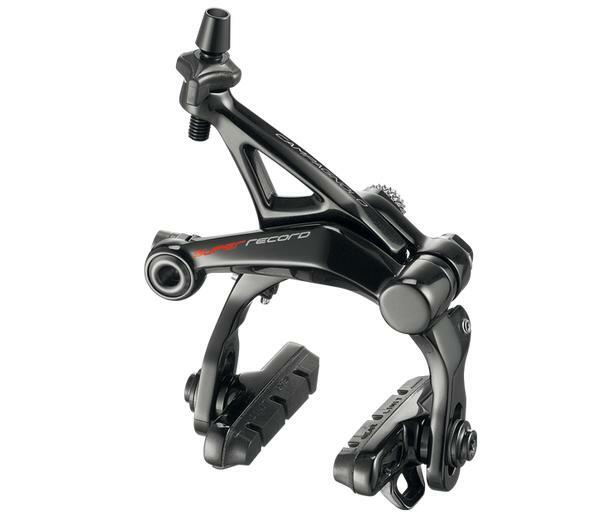 The conventional mount calipers are a very subtle evolution, retaining the wonderful dual-pivot rear design that we know and love, and which provides such great modulation. The latest iteration of the Direct Mount brakes see Campagnolo introducing some slight revisions based on feedback from their first generation, most notably a rear brace to add some extra stiffness. Both types of caliper brake will accept up to 28mm tyres. The discs come in a standard flat mount option, with 22mm pistons in phenolic resin for improved heat dissipation. They can run 140mm or 160mm rotors. All fairly standard stuff. 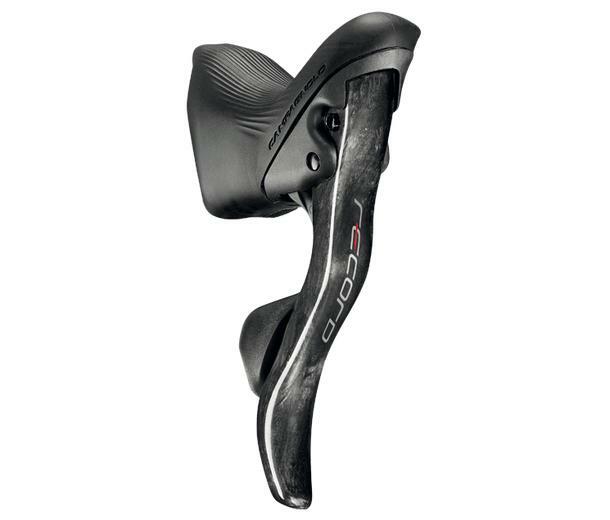 But it's the Ergopower Disc shifters that best highlight the Record/Super Record's strengths, with adjustable reach to cater for a wide range of hand sizes and the classic Campagnolo shape to the hoods, now slightly reshaped for improved ergonomics but still as comfortable as ever. Keep an eye on the Bespoke Build Gallery for our latest Campagnolo-equipped builds. Our initial feedback on the new 12 speed gruppos has been very positive, and we're looking forward to seeing them in action on customer's bikes over the coming months. If you'd like to go 12 speed, whether on your existing bike or a new build, get in touch and we can take you through the options.